Cockroaches are among the most disagreeable of household insects. They are associated with numerous pathogenic organisms, source of human allergens and assumptions of poor sanitation. Common household pests are American cockroaches, German cockroaches, and Brown banded cockroaches. Cockroaches start from an egg, develop into a nymph and finally an adult. An egg case laid by the adult usually contains between 16-50 eggs. Cockroaches are mechanical vector that carry various pathogens on their body. They have been found to carry the pathogens that cause tuberculosis, cholera, leprosy, dysentery and typhoid, as well as over 40 other bacteria (like salmonella, staphylococcus and streptococcus) or viruses (including polio) that can cause disease. Their shed skin may trigger allergy or asthma. 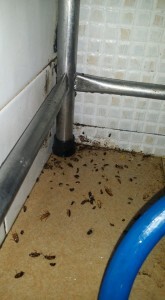 To get rid if an infestation, insecticide is usually used to eliminate the roaches. However this must be combined with good hygienic and sanitation practices.